Before the development of ultrasound devices, there was no way to safely diagnose the condition of a fetus (name given to unborn young from the end of the eighth week of development through birth). Prenatal surgery was extremely risky for both the mother and the unborn child. The other diagnostic method available was the use of X-ray radiation. But prolonged exposure to X-rays was hazardous, especially to a fetus. In fact, a 1958 study showed that there was a much higher rate of leukemia (a blood disease in which there are too many white blood cells) among children exposed to radiation in utero (in the womb). The same year that study appeared, however, a new science was introduced called ultrasonography. Using ultrasound technology, physicians were able to observe the condition of an unborn child using high-frequency sound waves. These sound waves created no apparent danger to the child or the mother. The man most responsible for the development of ultrasound technology was British physician Ian Donald. Donald served in the British Royal Air Force during World War II (1939-1945). At that time, top secret experiments were being conducted on radar and sonar devices. Following the end of the war the technology was released to the scientific community. This was about the same time Donald began his medical career. Ultrasonics was first used to test machine parts. It detected cracks, flaws, and bubbles in the metal. Donald was certain that ultrasonics could be applied in medicine, particularly in his field of obstetrics (the care of women during pregnancy). In the early 1950s he began working with engineers to modify the devices to observe the human body. Donald's ultrasonic device for medical diagnosis was first tested in 1957. With it, Donald used sound waves to correctly diagnose a patient's heart condition. A year later the procedure called ultrasonography was being used on pregnant women. 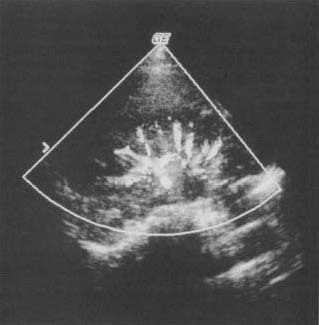 Since the 1960s improvements to ultrasonographic technology have made it the most common procedure for observing the fetus. The information gained helps obstetricians in treating individual pregnancies. In the thousands of ultrasonographs performed, no evidence of harmful effects has been found. Because of the safety of the procedure, ultrasonics has been applied to the diagnosis of other delicate organs. These organs include the heart, lungs, and kidneys. An ultrasound picture of a patient's kidneys. Ultrasonics is now being used in the treatment of certain conditions as well as for observation. A device called the Cavitron was invented in 1980. It focuses a narrow beam of sound waves on a tumor. The sound waves break up the tumor without removing it from the body. A similar method is used to pulverize (break into pieces) gall stones (small, hard objects that form in the gall bladder), making their passage much less painful. Ultrasonics works because sound waves of very high frequencies can easily and harmlessly penetrate human flesh. As the waves enter the body, they encounter substances of different densities, such as bone and internal organs. These different densities bounce back the waves differently to the wave source. Because each substance makes the waves reflect differently, physicians can identify the type of tissue by the type of reflection. An ultrasound machine uses the different signals to create a picture of the inside of the body. The Cavitron is an effective tool for treating ailments that previously required invasive surgery. It is particularly useful in the treatment of brain tumors.